Adelaide City recorded their third successive victory with a resounding 4-0 triumph over long-standing rival West Adelaide on Saturday. The match was the second of the historic double header, as earlier in the day Adelaide City’s WNPL team defeated the blue and white stripes thanks to a late Dylan Holmes penalty. The men started off the match the way the women finished, and almost took the lead after two minutes. Josh Mori went through on goal and rounded West Adelaide goalkeeper Lewis Moss, but the ex-Adelaide United youth product’s touch took him too wide and his cutback fell to Valentino Yuel, who couldn’t direct his shot on target. However, City broke the deadlock early, through Yuel himself just 12 minutes later. Yuel collected the ball on the right wing before beating West Adelaide left-back Matt Bouzalas and unleashing a pinpoint left footed strike beating Moss to his far post. City doubled their advantage a further 12 minutes after Yuel’s cracking opener when Moss brought down Anthony Costa. Experienced penalty taker Nicholas Bucco stepped up and converted the subsequent penalty, meaning he has scored twice from the spot in the past two matches. It was a dominant opening from City, and it was Costa who was the next to get his name on the scoresheet. Yuel sent a cross all the way through the penalty area which fell to Shannon Day who sent the ball back into the penalty area which was headed home by Costa. It was an unstoppable header, hitting the underside of the crossbar and crossing the line. City went into the break with a strong, commanding 3-0 lead. In the second half, City continued to dominate their opponents, with Costa adding another goal to his tally after Yuel’s cross was deflected into his path. Impressively, that was Costa’s seventh goal in his four matches he has started this season, as he looks to defend his Golden Boot crown from last year. 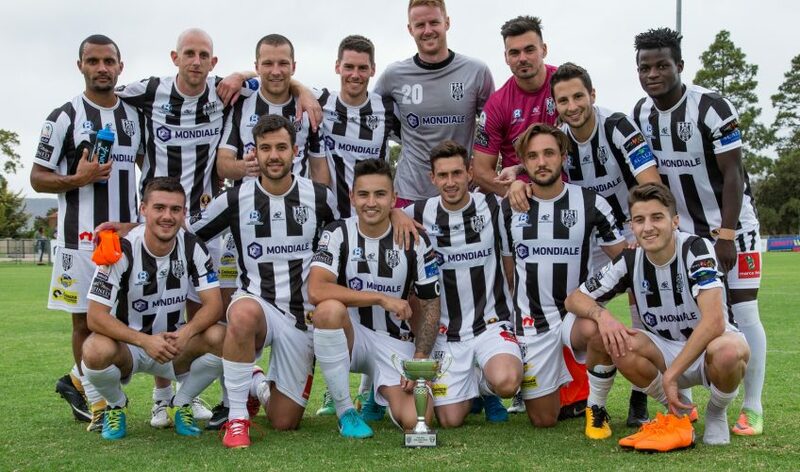 City held onto the clean sheet, as the men took home the Real Adelaide Derby Cup meaning that the trophy will stay at Adelaide City Park for the near future. Adelaide City host Adelaide Olympic next Saturday in a huge game for both sides.